North Jakarta and Seribu Islands Fire and Rescue Sub-dept., held fire training for residents living in RW 14 Warakas Urban Village, Tanjung Priok Sub-district.
" It is participated by 40 people who are consisting of representatives of RT, RW, Karang Taruna and PKK"
North Jakarta and Seribu Islands Fire and Rescue Sub-dept. 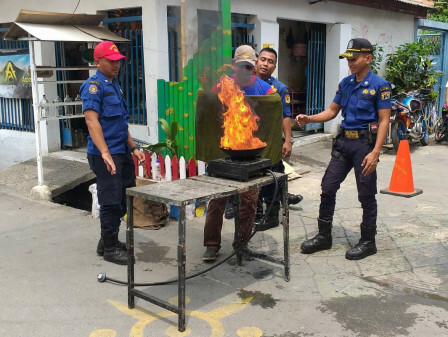 Head, Satriadi Gunawan stated that fire training includes providing simulation materials to extinguish fires due to gas stoves using simple extinguishers and portable fire extinguisher (APAR). "It is participated by 40 people who are consisting of representatives of RT, RW, Karang Taruna and PKK," he expressed, Sunday (11/4). Hopefully it could increase the ability and alertness of citizens against fire hazards. In addition, through simulations, they have provisions when they have to face the real situation. "We want this training to increase alertness. Thus, the frequency and impact of fires can be minimized," he stated.